Influenza also called as flu, is a respiratory illness that is caused by a virus. Flu is highly contagious and is usually spread by the coughs and sneezes of a person who is infected. According to the World Health Organization (WHO), 5% to 15% of the world’s population is infected by flu each year. High temperature, Joints and limbs pain, headache, fatigue, gastro intestinal symptoms that linger for about a week. There are three types of flu viruses ie infuenza A, influenza B and influenza C. Types A and B viruses are the cause of seasonal epidemics and it infect about 20% population of the world each year. The type C influenza virus may cause respiratory illness of mild nature but is not responsible for epidemics. Proteins on the surface of influenza A viruses can be divided into subtypes – the hemagglutinin (H) and the neuraminidase (N). 16 different hemagglutinin subtypes and 9 different neuraminidase subtypes are known to exist. A H1N1 and H3N2 are the current subtypes of influenza A viruses found in people. There are no B virus subtypes, but there are different influenza B virus strains. Spanish influenza killed 40-50 million people in 1918. Asian influenza killed 2 million people in 1957. Hong Kong influenza killed 1 million people in 1968. Practice safe hygiene and positive impact in public health . supply, excreta disposal, vector control, solid waste management and drainage. In 2005,in order to enhance predictability, accountability and partnership, Humanitarian Reform Agenda introduced the cluster approach with a clear mandate for improving coordination in emergencies. The Global Water Sanitation and Hygiene Cluster is a partnership grouping 32 partners and aiming at improving the coordination and the humanitarian response in the WASH Sector. The WASH cluster is led by the Ministry of Urban Development and co-led by UNICEF in Nepal. The WASH cluster is operational in Nepal since 2008 to respond to the displace people of Koshi Flooding. 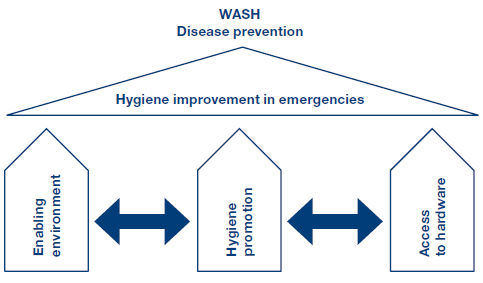 WASH looks after the water sanitation and hygiene of vulnerable communities. Its activities include long term resilience of the community through sustained waste access, water supply, initial need requirement assessment at the time of emergency situations to gather information on minimum water quantities required, minimum number of toilet and public places required, monitoring of water and excreta related disease transmission, household water treatments, and solid waste management. The WASH cluster in Nepal has made a preparedness status in case of an earthquake scenario in Kathmandu. According to the report, the water demand of Kathmandu valley is approx. 320 million per day where as the current supply is 160 million per day. UNICEF conducted seismic vulnerability mapping of the drinking water supply system in 2003 along with the capacity mapping in 2008. The cluster has prepared a contingency plan with the participation of Government of Nepal, UN and other I/NGOs. UNICEF has made 22,000 standard hygiene kits available along with prepositioned stock of WASH supplies that include water tanks, toilet slabs, buckets, and water treatment equipment. A Prime Minister Disaster relief fund release policy 2063 was formulated to set up a Prime minister relief fund and to define the policy for the use of relief fund so that effective assistance can be provided to the disaster victims. The Fund is operated by the committee of 8 members, secretary from the Prime minister office being the secretary. All the amount of the fund is deposited in Nepal Rastra Bank or any other bank. The amount of the fund shall be operated with the signature of at least two persons. The committee can share its rights of using fund with CNDRC or DDRC as per requirement. Rescue of the disaster victim and protection of property. Aid for dead body management. Secretary: Coordinator, Office of Prime minister and council of ministers. The accounts and Audits is maintained in accordance of the prevalent law. Central disaster relief committee arranges for standby search and rescue materials for immediate response. Risk assessment and hazard mapping for minimizing risk and warehousing of relief material in centre, regional and district level. Identify the type of disaster the district is vulnerable to . Maintenance of standby skilled manpower at least 25 . For search and Rescue , in all 75 districts , rescue equipments are warehoused and 25 persons are kept standby. Provision of central disaster relief fund of 7 lakh and District disaster relief fund 3 lakh. Socials worker, Ngos should coordinate with LDRC for public awareness about disaster management. The displace people should be organized in a camp that is established in a open space other than school and healthpost. DDRC should coordinate national and international Search and Rescue team. DDRC should provide 40000 for the family of person who die in a disaster. If a house and food crops are destroyed due to disaster, for emergency sustainment of life Rs 5000 per family is given. If camp has to be organized, DDRC should coordinate MOHA. If food and financial aid is to be provided, the details should be sending to MOHA. The aid should be provided through either LDRC or DDRC. The presence of elected Member of Parliament/ leaders of all political parties encouraged. If the situation of local displacement is prominent upto 20,000 aid can be provided after the decision of DDRC. For the contingency situation CNDRC can provide additional 15000/ Family. The treatment of disaster victim in governmental hospital is free. RS 1000 to be provided for further care. For the rehabilitation and Reconstruction Ministry of forest should provide subsided wood. If any member of disaster victim family wants to go for foreign employment, DDRC should recommend to Department od labor and transport. The victims of Earthquake , Flood, Landslide, Thunderstrom, Strom, Cold web , Snow Fall , Air, road accident and boat capsize due to disaster are only liable for aid. CDO can spend Upto Rs 5000, through the decision of DDRC. The actions mentioned above can only be implemented by DDRC within the 30 days of disaster. A website of National focal point should be made for information dissemination. NEOC and CDO office should update the statistics of central and district level of disaster and publish it annually. RDRC should evaluate and supervise the work of DDRC at least one time a year and send report to CNDRC. CNDRC should deploy supervision and evaluation team to monitor the activities of RDRC and DDRC . Nepal Government provided medal and prize for those who do commendable work during disaster. Assigning responsibility to an agency for dead body management in central and district level. Training and awareness for proper search, transport, storage, identification and management of dead body. The central responsibility of management of dead body is of MOHA and NEOC. In district level the responsibility of dead body management is of DDRC and CDO office. There is provision of dead body management committee in every districts that comprise of 8 member that includes members of the Nepal Police, Armed Police Force, Hospitals, Army, Red Cross and DDR The secretary of the committee is the CDO of each district. The security of relief workers like use of boot, gloves and personal safety equipments. Each dead body should be given different number. If the body is shattered each parts should be given a different number. Before wrapping up a dead body four pictures from different angle ie face , whole body , body below chest , body above knee should be taken . Identification form should be filled. Dead body should be covered. Ambulance should not be used. By secondary methods like observation, photograph , details , clothes etc. Capacity Building program: The program to enhance the capacity to manage the dead body effectively should be endorsed. Advocates for effective application of humanitarian principles. Respect for mandates: IASC respect the mandates of individual organizations. A cluster is a group of organization working together to improve the humanitarian response. Humanitarian coordinator leads the cluster at country level. In 2005, in order to enhance predictability, accountability and partnership, Humanitarian Reform Agenda introduced the cluster approach with a clear mandate for improving coordination in emergencies. The decision lies primary in field. After the disaster the initial need and gap assessment is done. To fill the gap the appropriate sectors are activated by the humanitarian coordinator in close consultation with the Humanitarian country Team. United Nations Humanitarian Civil-Military Coordination (UN-CMCoord) is essential for the establishment and protection of the ideal humanitarian operating environment in emergencies. Cooperation and co-existence are two strategies that can be applied in certain emergency contexts. However competition and conflict may still occur. It is essential that in the times of disaster, the military and civilian actors involved in response, must coordinate in critical areas in order to enhance cooperation and co-existence and minimize competition and conflict.The critical areas for cooperation can be security, logistics, transportation, communications, health and information. Support the establishment and sustainment of dialogue with military forces. Assist in the development and dissemination of guidelines for the humanitarian community’s interaction with military forces and armed actors. Establish a mechanism for the coordination of the UN humanitarian interaction with military forces and other armed actors. Monitor assistance activities undertaken by the military forces. Assist in the negotiation of issues in critical areas of coordination. "Nepal Flu Pandemic: Causes and Solutions." UKEssays.com. 11 2018. All Answers Ltd. 04 2019 <https://www.ukessays.com/essays/health/nepal-flu-pandemic-causes-solutions-8071.php?vref=1>. "Nepal Flu Pandemic: Causes and Solutions." All Answers Ltd. ukessays.com, November 2018. Web. 24 April 2019. <https://www.ukessays.com/essays/health/nepal-flu-pandemic-causes-solutions-8071.php?vref=1>. UKEssays. November 2018. Nepal Flu Pandemic: Causes and Solutions. [online]. Available from: https://www.ukessays.com/essays/health/nepal-flu-pandemic-causes-solutions-8071.php?vref=1 [Accessed 24 April 2019]. UKEssays. Nepal Flu Pandemic: Causes and Solutions [Internet]. November 2018. [Accessed 24 April 2019]; Available from: https://www.ukessays.com/essays/health/nepal-flu-pandemic-causes-solutions-8071.php?vref=1.